Please welcome @fishtankfairy (and follow her on Twitter), the first Stickytarts guest blogger. A busy working mum, and ex Britney Spears impersonator - yes really, Fishy shares her experiences of painting wall murals for her children's bedroom. I think you will all agree that she is a very talented individual ! "Sticky has kindly asked me to be a guest blogger on her site and write a bit about the murals/drawings/scrawls (I’ll allow you to decide for yourself), that I did for my children’s bedroom walls. Let me tell you a little about myself first – I am a 28 year old mother of two and wife of one, with a strange and quirky sense of humour. I enjoy anything arty and crafty, and love gardening, not only because it’s part of my job but also because I find it to be a good destressor. I am an animal lover, with elephants being my favourite, but as it is probably illegal to own one in Scotland, I’ve settled for being animal-mother to one very crazy dog and two equally bonkers house cats. I have been married for five years now to, what must be, a very patient man. After a few months of marriage we decided we should do the children thing, which resulted in discovering on our one year anniversary that we were expecting our son, Mk1 (now three). We are obviously a silly lot, because once we moved to a bigger house we thought another one would be a good idea, thus resulting in Mk2, our daughter (now one). Our house only has two bedrooms so this means the two have to share. When it came to decorating their bedroom, I wanted something bright and colourful. It also had to be something that would grow with them and would mean not having to redecorate every couple of years. I decided that my original idea of a striped wall of ‘boy’ colours and one of ‘girl’ colours would be too difficult (!?1?! ), so I spent hours on the internet searching for inspiration and ideas. 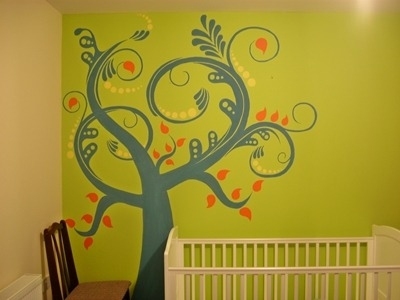 I eventually found a site specializing in wall art stencils, but with the size of the wall mural and being on a tight budget this proved to be too expensive. Being quite arty and loving a creative challenge, I therefore decided to create my own wall mural using the site for inspiration. This way the end product would be totally unique and exactly to my taste. Mk1’s wall had to be something that was not too flouncy or flowery for a little boy, but I didn’t want it to be too simple either. 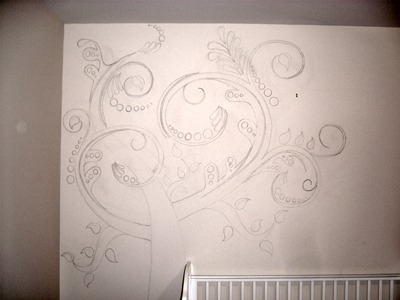 So I decided on a tree with swirls and leaves detail. 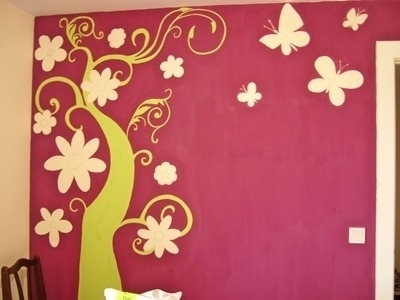 Mk2’s wall had to be really girly, but not too stereotypically girly, so for her it was a tree with flowers and butterflies. I started by creating 3” x 3” pencil sketches of the trees I envisaged and then armed with pencils, rubber and sharpener I went about recreating these on a large scale. First were the outlines, which consisted of a lot of pencil scrawls and rubbings out, hence a few dirty marks on the walls that show up in the pics. The actual painting was the time consuming part, which I mainly completed using matt emulsion in three coordinating colours - blue, lime & Jazzbury purple. 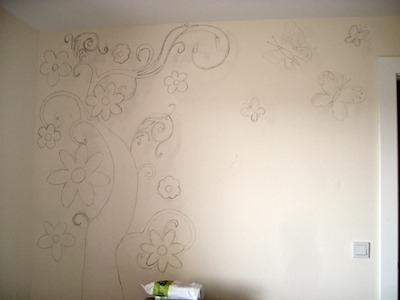 The details of the leaves, circles, flowers and butterflies were all done with little tester pots. Using little rollers and little paint brushes proved to be best for this, but getting into all the little nooks and crannies was a nightmare. I lost count of how many hours it took me to complete the whole project as it could only be completed in my sparse free time in between breastfeeding, usually on a Sunday afternoon when hubby was around to watch Mk 1 & Mk2 leaving me to concentrate. I started it in July and finished in December!! I would, however, do it all again. I thoroughly enjoyed getting creative and am really pleased with the results. Best of all the kids really love their trees ." I hope you have enjoyed this guest blog. If you have, please leave a comment or tweet Fishy ! If you would like to feature as a guest blogger yourself and show off one of your creative projects (whatever it might be) then please contact us.